Happy Shoesday! 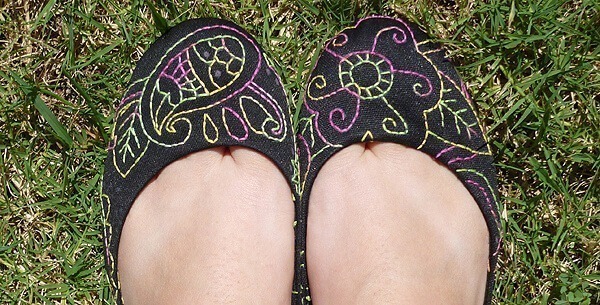 This week I am sharing my newest project for my feet – Doodle embroidery super kicks. What’s so super about them? Well, it took me 17 hours to embroider one shoe and adding the word “super” makes me feel a bit better about all of the time spent making them! I love, love, love these hot little babies so the project totally seems worth the time to me. It’s kind of like when you make a quilt. You start off excited and toward the middle, you just want to get it finished up already. So, if you’re patient and don’t mind working on your shoes for a decent amount of time, I’d really recommend this project to you! In the end, it is incredibly rewarding! I didn’t really take pictures while making these mostly because I worked on them while out of town. Sorry for that, but it’s a really easy process and in the long run you don’t need them anyway. So, want to make your own? 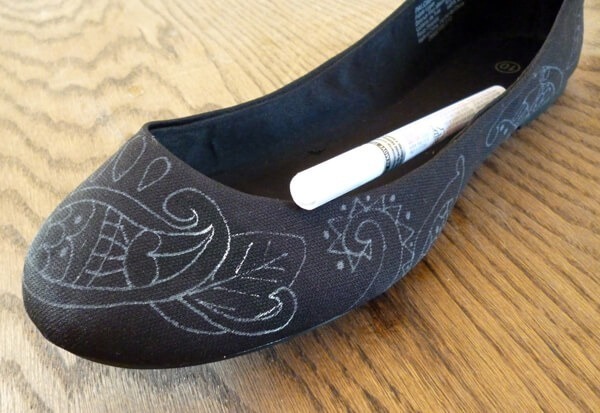 Fabric Shoes – You’ll need fabric or canvas shoes to embroider. Leather or other tough materials would be impossible to work with on this scale. You’ll also want to make sure that you can easily access the inside of the toe. I got some flats that had a fairly small area for the toe. The longer that area, the more difficult it will be to get your needle down there, up and through again. Lastly, and most obviously,be sure they fit. 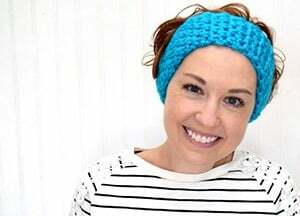 I didn’t try mine on until after I completed the project and I got the wrong size! :) Oh, well. If you want to pick up some flats like mine, head to Wal-Mart where you can get the same pair for $5. Pen in Contrasting Color to Shoes – I used a regular old white paint pen because I was go be embroidering over it and didn’t mind if the white kind of peeked out – but use a temporary or removable transfer type of pen if you want to make sure that you will not see the lines. Thimbles or Bandages – Fair warning, you can really jack your fingers up working on a project like this. I wound up putting bandages on my index finger and thumb to protect them. When you are pushing your needle though, sometimes you’ll meet resistance. Trust me when I say pushing the dull side of a needle up into your finger is not pleasant. To make your shoes simply doodle and follow behind and embroider. You can fill as much or as little space as you’d like. Either make both shoes the same, or do like I did and make them both completely random. The choice is yours! I hope that I’ve inspired you to embroider your own super kicks this Shoesday. Until next time! Gorgeous! I've pinned it! Don't know if I have your patience though. Thanks for the pin, Pebbles! Simi – you never know until you try. :) I'm sure they'll be awesome!